A product that has incredible drum fills, innovative FX drum fills, and tools to help you make your own drum fills in a ridiculously easy way? Welcome to Really Really Good Drum Fills! A product that has incredible drum fills, innovative FX drum fills, and tools to help you make your own drum fills in a ridiculously easy way? Welcome to Really Really Good Drum Fills. Steve Roland (Black Octopus C.O.O.) 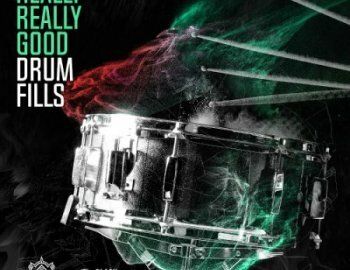 and Ahee (the mastermind behind the Beats From The Bass Ship series) bring you an incredibly well put together collection of drum fills and drum fill design tools. Non-compromising attitudes of incredible sound quality and decades of combined musical experience went in to producing these huge, crisp, phat, and super groovy loops, one shots, and racks. This pack has 4 main folders inside. Drum Fills which include 1 to 2 bar long drum fills in 11 different BPM’s ranging from 85bpm to 170bpm. The Drum Fills FX folder are sound bending, mind melting, effected Drum Fills that add innovation beyond the phat crisp drum hits of the non-effected folder. The One Shots folder includes many of the drum hits that were used to make the drum fill loops, so you can use them to make your own! If you’d prefer to make your own drum fills with this pack we’ve got you covered there too! Inside is an Ableton project file with midi files and two different drum racks, pre setup and ready to customize! Inside is also a tutorial video with drum fill design tips using the files provided!